WASHINGTON – Friends are mourning an 18-year-old high school senior who Prince William County police say was killed over the weekend. Kenny Joseph Diaz was found bleeding from an apparent stab wound to his stomach in Marumsco Acre Lake Park in Woodbridge, Va., around 3:15 p.m. Saturday, police say. 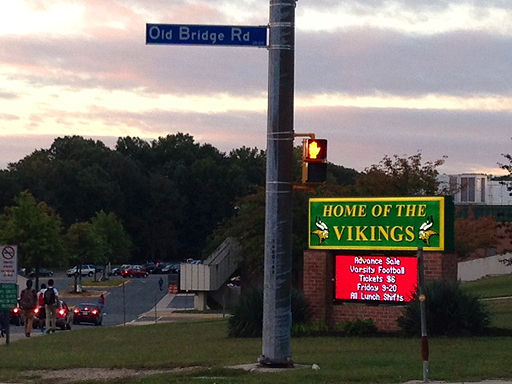 Diaz, who played football for Woodbridge High School, was transported to a hospital where he later died. Diaz’s friends walking to school Monday morning wore red, his favorite color, in honor of their friend. “He was a good guy. He was always smiling. I really don’t understand why someone would do that to him because he didn’t really bother nobody,” says Blaine James, a junior at the school. Wearing a red T-shirt and a Redskins lanyard around his neck, James talked about Diaz’s love for the team. “I wore this [lanyard] because I think the Redskins are his favorite team. Even though we lost, I know it means something to him if I wear it. I hope he’s resting in peace right now,” James says. Many of the students found out about Diaz’s death on Facebook. Andrew Collins had class with him. “Kenny was just that chill guy. He was on varsity football. Everybody knew him. He was just funny … He made everybody laugh. He was the clown,” Collins says. Grief counselors will be available for students Monday. Police say the investigation is ongoing, and the incident doesn’t appear to be random. Family members who placed flowers near the spot Diaz where was found Sunday expressed disbelief and sadness at his death, ABC7 reports. Anyone with more information is asked to call Prince William County Crime Solvers at 703-670-3700. WTOP’s Megan Cloherty contributed to this report. Follow @ClohertyWTOP and @WTOP on Twitter. homicide Latest News Local News marumsco acre lake park Prince William County, VA News prince-william-county Virginia woodbridge, va.